The discrepancy boils down to staffing. 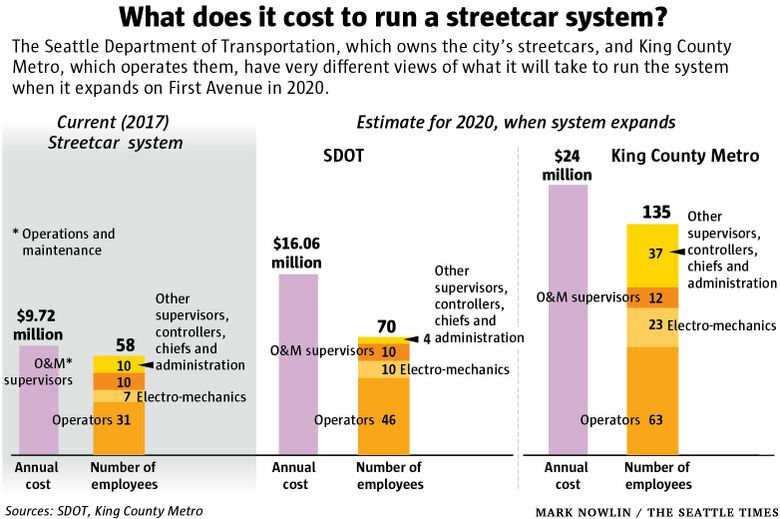 Metro thinks it will need almost twice as many employees to operate the streetcar system — including operators, mechanics and supervisors — as SDOT does. Seattle’s expanded downtown streetcar system, now under construction, will cost 50 percent more to operate than the Seattle Department of Transportation has publicly said, according to an internal memo from King County Metro, the agency that operates the streetcars. 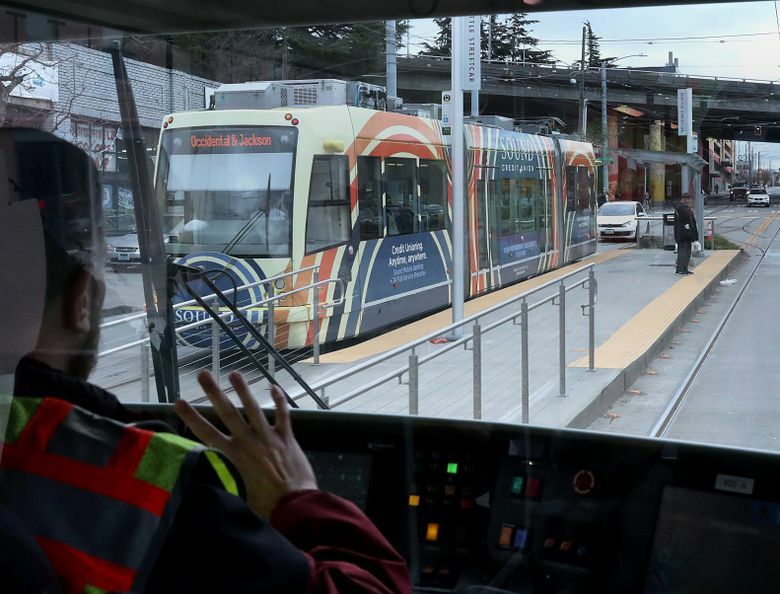 In documents submitted to the Federal Transit Administration (FTA) and the Seattle City Council, SDOT has estimated that the expanded streetcar system will cost $16 million a year to operate, once it opens in 2020. But Metro, which is under contract to run the streetcars, says the new system will cost $24 million a year. SDOT used its lower estimates to apply for federal grants and to get final approval for the project from the Seattle City Council. The memo, and other documents obtained through a public-records request, show SDOT pushing to get the streetcar project moving and brushing aside concerns from both its partner agency and the City Council, which was worried that the streetcar could siphon city funds from bus service and other transportation priorities. Four City Council members questioned the wisdom of the streetcar project last fall, including one who was dubious about SDOT’s financial projections. All were unaware of the interagency dispute over costs. SDOT did not respond to interview requests or a list of questions. Instead, the agency released a joint statement with Metro, stressing their history of working together on transit projects. “Metro is further refining its previous cost estimates and together we are working closely on a joint streetcar operations plan,” the statement said. They said they expect to have final cost estimates and a final rail activation plan in the coming months. Councilmember Lisa Herbold has consistently been skeptical of the streetcar expansion, raising concerns that its ridership projections were too optimistic and it could run deficits in the future. She said her past projections showed a possible annual deficit of just over $2 million. “Now we find out that the annual operations deficit might be an additional $8 million a year,” Herbold said, when informed of the dispute. She noted that one of the recommendations in the memo is that SDOT should tell the mayor and City Council that Metro was not involved with the cost estimates and that costs could be significantly higher. The city broke ground last year on the new $177 million, 1.2-mile streetcar route. 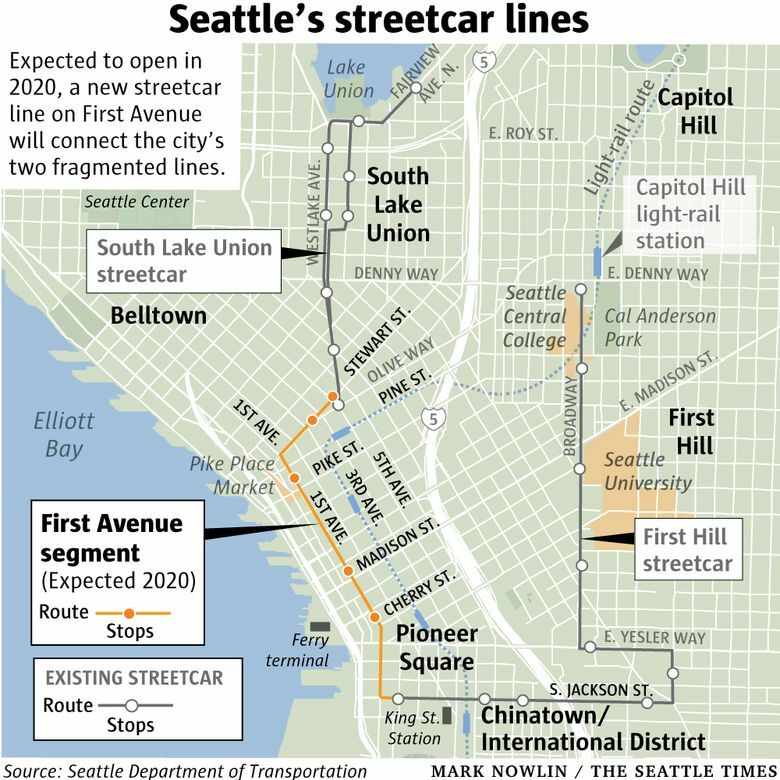 The new line will run along First Avenue — mostly in its own lanes — connecting the fragmented streetcar routes in South Lake Union and on First Hill. The city has high hopes for the new line as a crucial transit link across a downtown growing ever more congested. It expects that the new streetcar, when it opens, will more than quadruple ridership on the entire streetcar system, which has failed to meet ridership projections. And the city thinks it can do that with only a modest increase in staffing — from 58 current employees to 70 employees. Metro thinks the new, expanded streetcar system will require 135 employees. Once the new system opens, streetcars should arrive at downtown stops every five minutes during peak hours. That will require 14 streetcars operating simultaneously for 13 hours a day, seven days a week. During early-morning and late-night hours, nine streetcars will run at a time. SDOT anticipates this will require 46 streetcar operators. Metro thinks it will take 63. SDOT thinks they’ll need 10 electro-mechanics to service the vehicles and the track. Metro thinks they’ll need 23. There are similar chasms across other job descriptions. Last summer, when the Seattle City Council gave the go-ahead to SDOT to accept federal grants to build the streetcar, council members expressed skepticism that the new system would live up to expectations, worrying that low ridership and fare revenue would mean dipping further into city money to support the system. “I don’t want to see transit dollars for city service used to cover operational shortfalls,” Herbold said at the time. So the City Council required SDOT to return in the fall with a more detailed financial operating plan. But first, SDOT submitted its operating plan to the FTA last summer, part of the grant application that has already netted $50 million for the project and is expected to bring $25 million more later this year. Metro repeatedly offered input on the plan, but was basically ignored, according to the memo. Metro employees didn’t even get to see the operating plan until after it was submitted to the FTA. Once Metro realized that SDOT had submitted the lower cost estimates to the FTA, Metro staff again reached out, telling SDOT the numbers were too low and offering expertise. Andrew Glass Hastings, SDOT’s director of transit and mobility, responded “you aren’t changing anything in this operating plan,” according to the memo. Instead, SDOT submitted the same costs to the Seattle City Council in the fall. The council had requested contingency plans in case the streetcar lost federal funding or collected less in fare revenue than SDOT anticipated. SDOT’s report said the agency would identify “alternative funding sources” if it lost federal money, but offered no further details. Meanwhile, Metro staff continued to tell SDOT that they were not on board with the cost estimates. The next month the City Council passed its 2018 budget, with full funding for the new streetcar expansion.